We all know that eating well is important. And if you listen to the details about what’s good, what’s bad, and what’s ugly, your list of edible foods can rapidly shrink. While it’s easier – and certainly cheaper – to eat what’s available, fast, and inexpensive regardless of quality – in the end eating well is not just good for your body, but nice for the earth, too. I’m prepping for a section on the PCT this September (central through northern Washington) and the goal is to eat as well as possible – cut out the crap and add in the good. 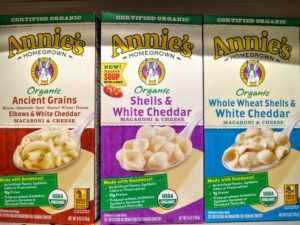 Minimize processed foods – although I am going for food that is as “instant” as possible, so I will have to weigh the pros and cons here. I will be eating jerkies, a few brands of bars, etc. Anti-inflammatory foods – like green tea, garlic, etc. Adequate protein from jerky, cheese, fish, and some TVP. 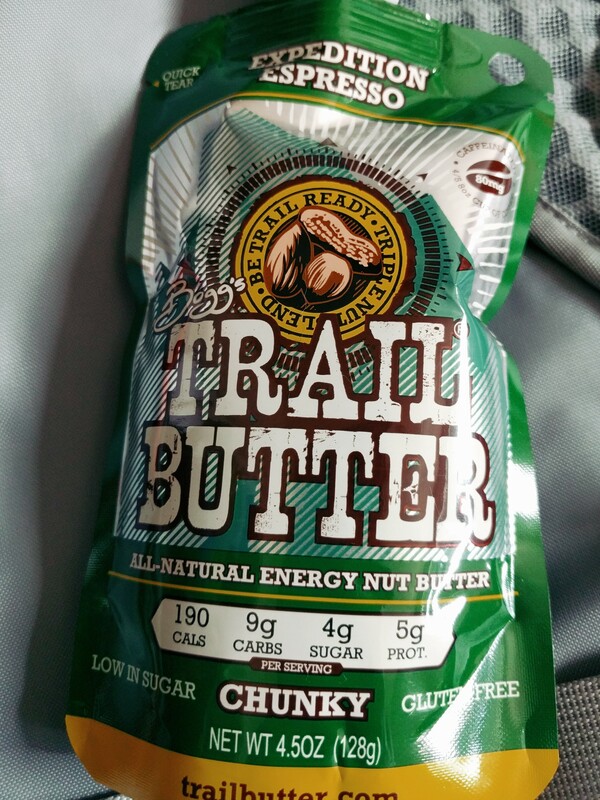 There are plenty of foods that sound really good that are usually on my trail menu and will be tough to give up. I will NOT be eating these foods (for e.g. ): Snickers, Spam, M&M’s, Pro Bars, non-organic Clif Bars, Skittles, Sour patch kids, Ramen (including Nong Shim), Idahoans, non-organic Annie’s Mac&Cheese, instant grits, Starbucks Via, Gatorade Powder (and other electrolyte powders), and any and all other most non-organic foods. So specifically what will I eat? Here’s a list of many of the delicious and nutritious things I plan to ingest! Trail butter gets a decent score. 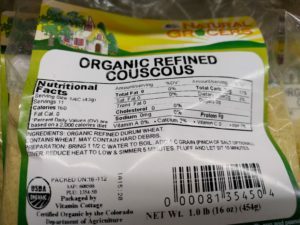 While it is processed and includes espresso (at least the espresso edition does as you could probably guess), it IS all natural and Bogg’s is on their way to certified organic status. Did I mention that it’s delicious, too? If you are buying it, go for the big pouches over the small ones – they are chunky versus creamy and so much more tasty… Top dried fruit on a tortilla for a good breakfast. Or generally inhale if you’re hungry. Delicious. And certified organic. If I was a stickler, I’m sure I could avoid all sugars of all kinds…but I have a time table, and miles to make so I need that sugary energy. Plus it has minerals and antioxidants which at least I can say is more than your average table sugar. And it’s not exactly processed, only concentrated. Only critique: UnTapped should come in different grades (eg A, B)! Ok, so I may be the grandchild of sugar makers in New Hampshire and thereby have high maple syrup standards and want that dee-lish dark B… But seriously it’s amazing – go get some. 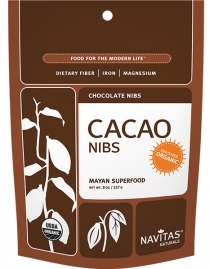 Great on oatmeal for breakfast, added to hot chocolate for dinner, or on it’s own. Several companies are making the little squeezy pouches of raw, unfiltered honey. 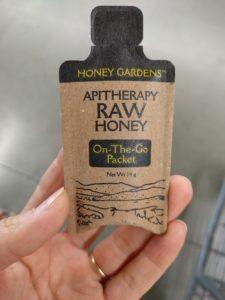 Bonus: honey is antibacterial and antifungal. Good news: Nature Nate’s Naturals is being carried in Walmarts across the country now or very soon which will make it easily accessible. Going on a longer hike? 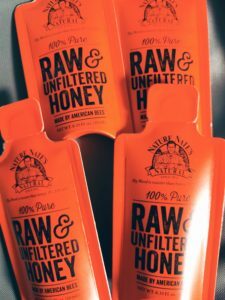 Take a larger container of any raw unfiltered honey (preferably local). I love it in my morning tea or on it’s own for an energy boost. 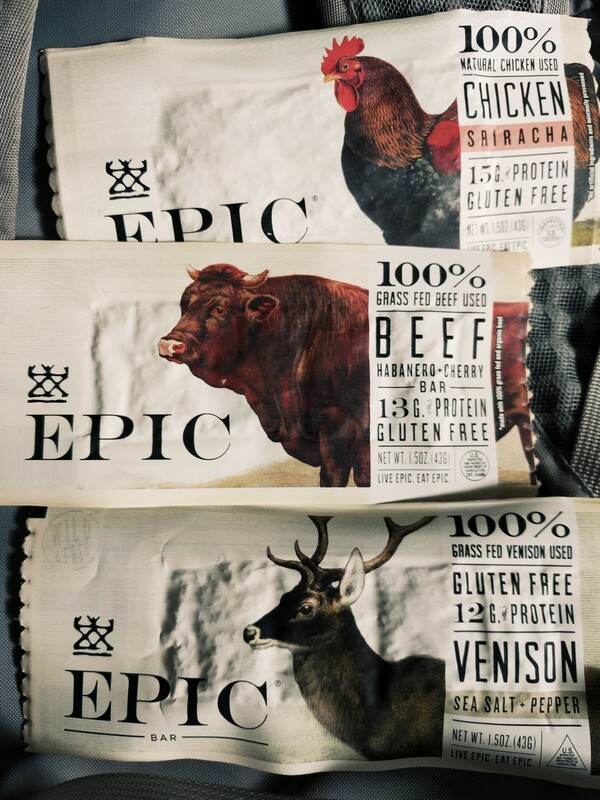 EPIC bars are delicious. 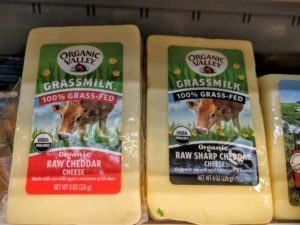 Ok, so they are processed and not technically certified organic, but they do use grassfed and/or natural meats and organic ingredients when possible and are pretty up there on the conscientious scale. 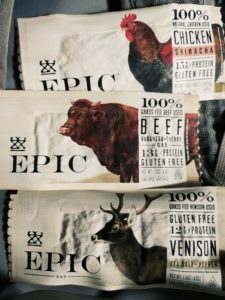 They now make not only bars, but jerkies and uncured bacon as well. 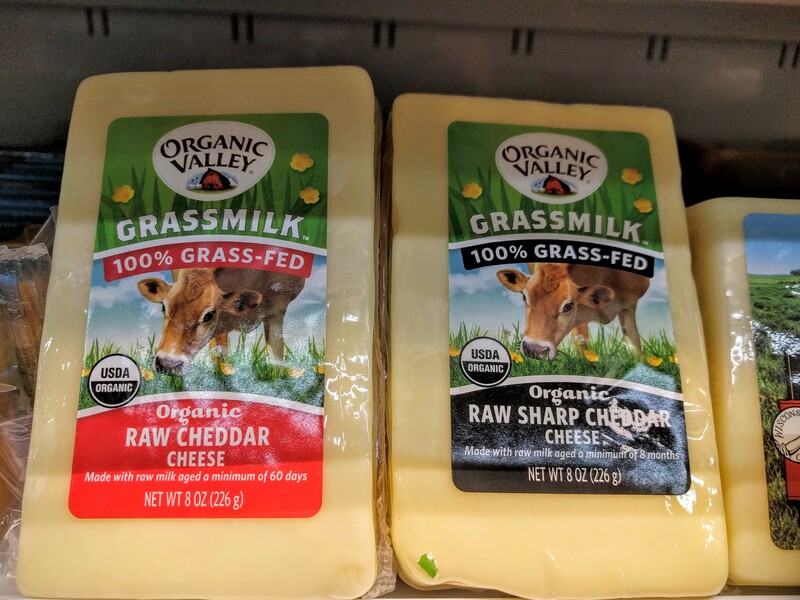 The company is also now producing lards/cooking fats as well as bone broth in order to maximize the use of every animal – thumbs up on full animal utilization. Other brands/organic jerkies are delicious too. Eat as a standalone snack, or chop up with other ingredients (like sriracha chicken plus pasta and peanut butter – or beef, beans, and cheese) and tuck into a tortilla for dinner. Their fruits and veggies are organic and they carry TVP, beans, soups and oh so many fruit and veggie options. *However, their products do contain preservatives which is not ideal but otherwise the quality of their food is good. Overall = decent. I plan to add veggies and TVP to as many dinners as possible – onions, garlic, corn, peas, carrots, potatoes, etc, etc. 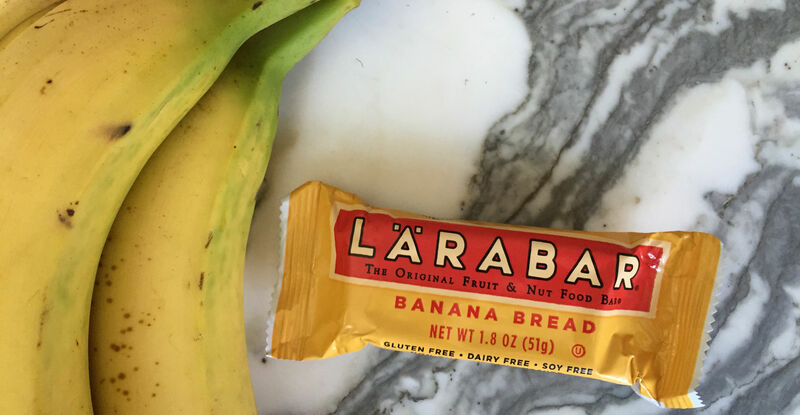 Larabars are natural and don’t contain additives or other chemical grossness. Their traditional bars, while not organic, contain merely 3 ingredients yet manage to taste consistently amazing and surpass my flavor expectations every time. 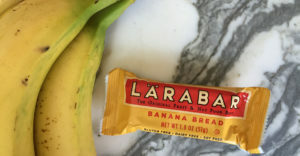 Larabar does carry bars that are organic, however. The organic ones are labelled “organic with superfood” are just that – organic and contain superfoods – like the Turmeric, Ginger, & Beet bar. I haven’t seen them in stores yet but would love to try them. Eat on their own or slather with PB or trail butter. PS – I also plan to eat Kate’s bars and Clif organic bars. From the bulk section at my local co-op! Goes great in burritos or eat with tortilla chips. 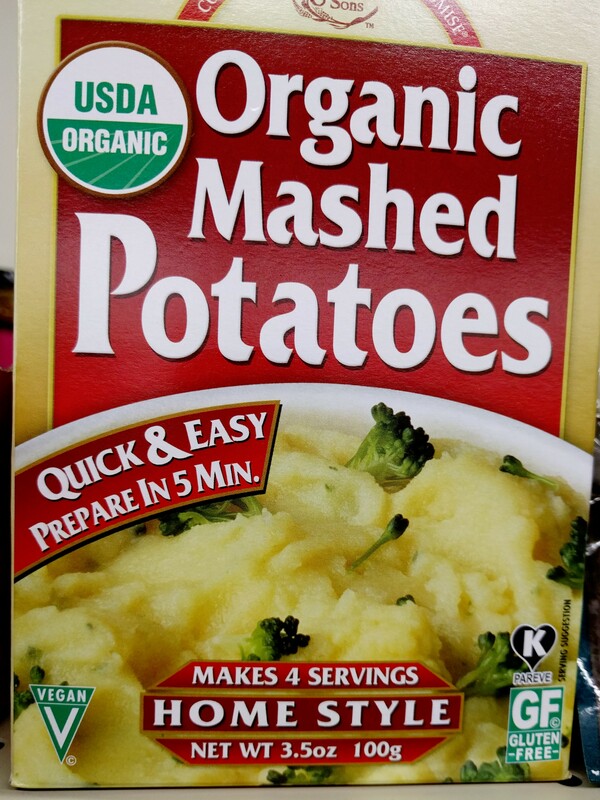 I’m not sure the brand on these mashed p’s, but they’re pretty good. 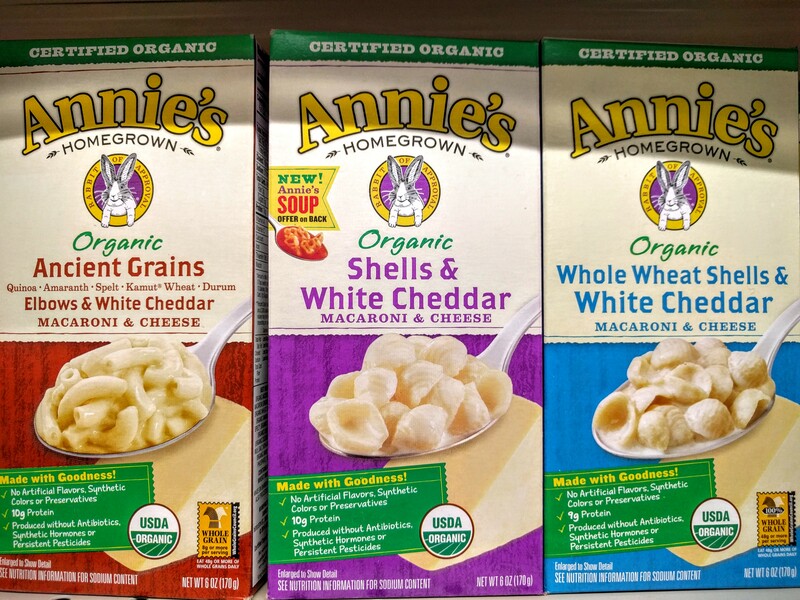 They contain real ingredients – potatoes, oil, and a few spices – and are certified organic. 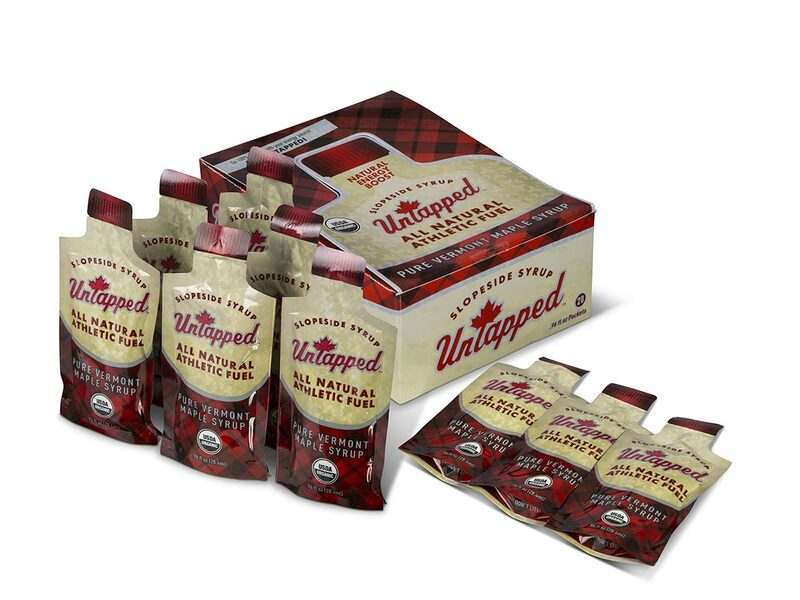 They will make an excellent addition to my thanksgiving dinner trail food (chicken TVP+thanksgiving spices+dried cranberries+walnuts+powdered milk). Yum. Organic tortillas are just as good as the crappy plain ones (which I find to be heavenly)! You can find flour, corn, wheat, etc. 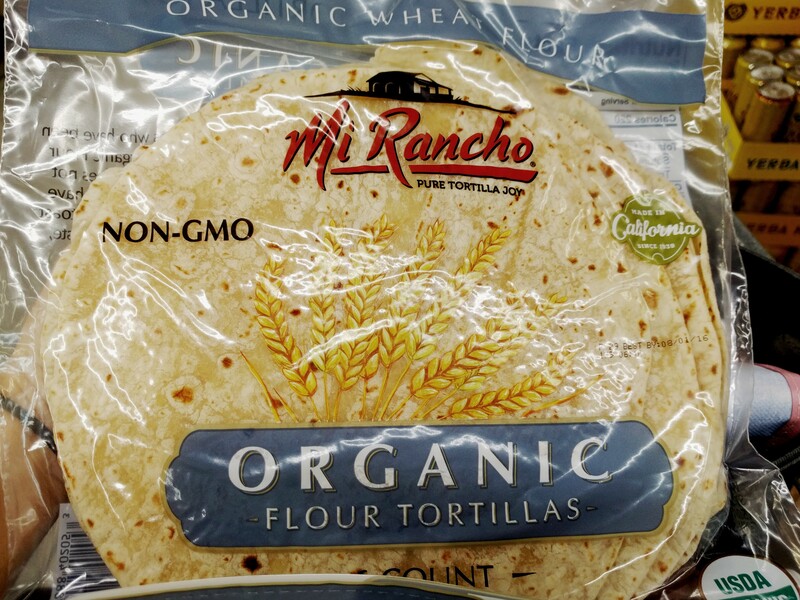 While I normally aim for wheat (or whole, sprouted wheat) when possible, I have to admit, the plain white ones are the most edible and so are my go-to-tortilla. Makes a great burrito, base for trail butter and dried fruit, or general edible envelope for foods of shapes and sizes. 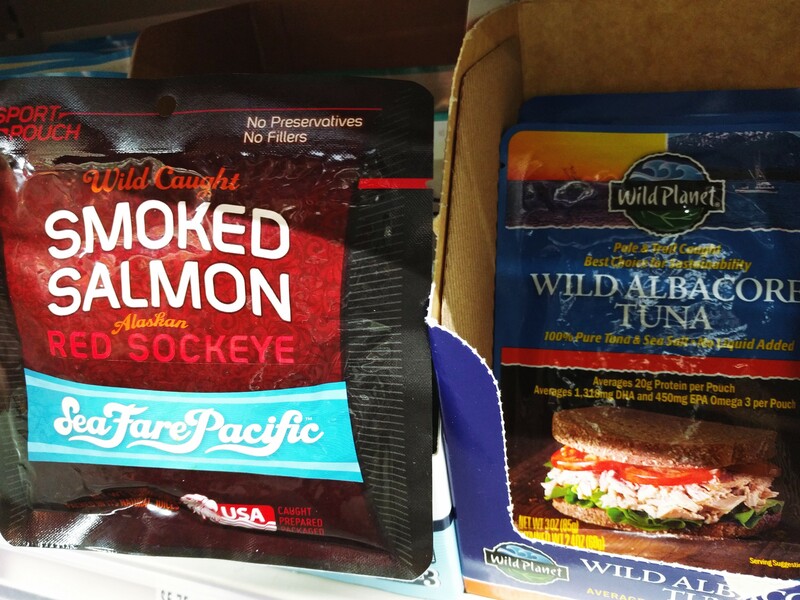 There are several brands to choose from – like SeaFare Pacific and Wild Planet – that come in those ol’ handy pouches. A bit pricey, but really tasty, got them omega-3’s, and of course high in protein. Good addition to a noodley dinner, with rice, or mixed with nuts and fruit in a tortilla. The cost of these puppies adds up – but they’re delicious! Real food?! While the weight and bulk adds up, I’ll carry the occasional real food item like an avocado or orange. Probably lots of garlic – which goes a long way and helps reduce inflammation especially if eaten raw (like in a tortilla with tuna and cheese). So good! Yeah it’s processed, but it’s organic and easy to find and easy to make – hence I’ll be both carrying and ingesting it. 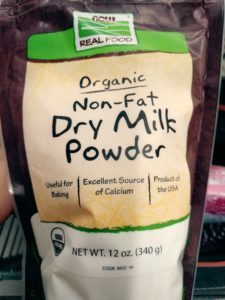 The powdered stuff is good, but the really good stuff is the “deluxe” with the creamy goupy cheese – hard to find in the organic variety but worth tracking down in my opinion. Green tea is good for your brain! I’ve recently switched to it from coffee because it also helps stabilize blood sugar and makes me feel better/less crappy. Bonus: it contains antioxidant and nutrients. Did I mention caffeine? (not always a “pro”, but always a “must” – generally 1/2 to 1/3 that of coffee). 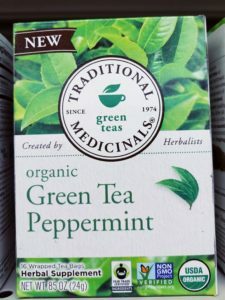 Confession – I don’t like the taste of green tea on it’s own :/ but mixed with mint tea it is actually quite delicious. 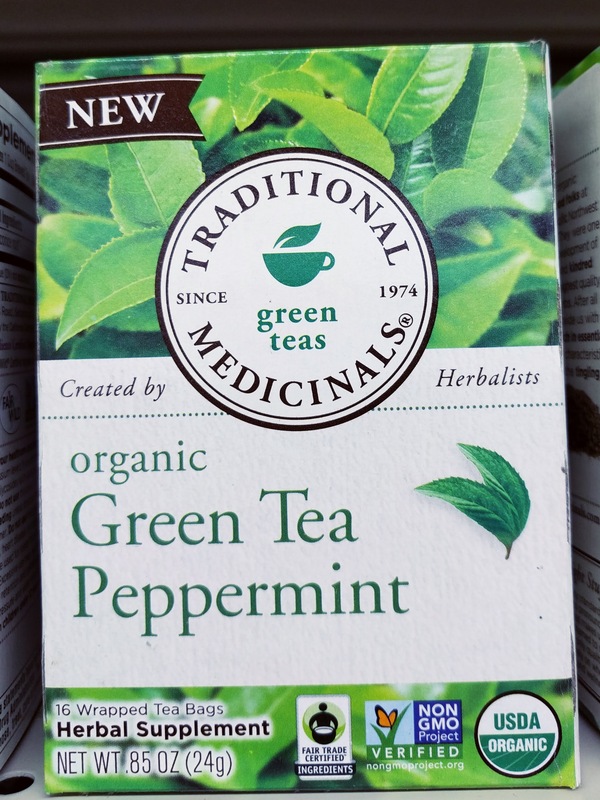 Traditional Medicinals offers a Peppermint Green Tea which is organic, too. Yes, I’ll bring other real foods too! The organic, no sugar added, no preservatives variety, of course. Check those ingredients, folks! My faves include almonds, walnuts, pumpkin seeds, cashews, macadamia nuts, raisins, dried cranberries, dried apples, dried mango, etc. A favorite trail meal: mix up tuna, walnuts, and dried cranberries – toss on on a tortilla and enjoy. 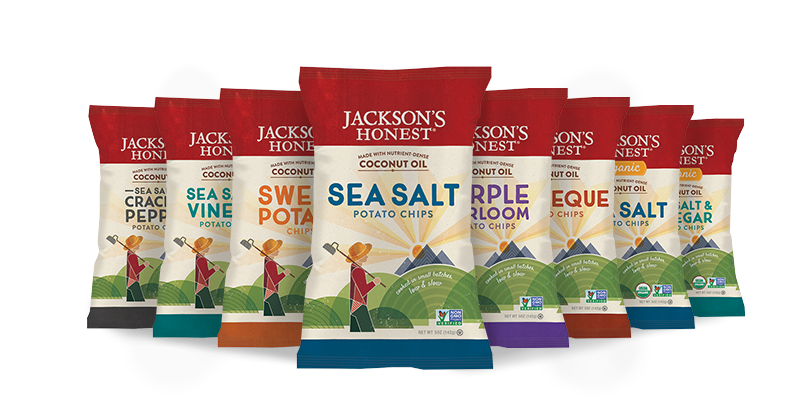 Jackson’s chips are really good, real ingredients, cooked in coconut oil, and organic. 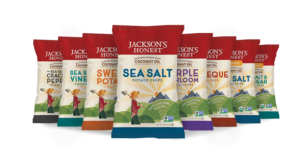 There are many varieties including potato, purple potato, red potato, sweet potato, and they have a line of tortilla chips (which will be good for eating with rehydrated beans and veggies). The salt in the chips will be key, too, especially since I wont be drinking Gatorade or other energy drink powders. 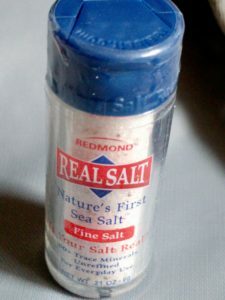 The Real Salt brand is natural and harvested (?) from an old desiccated lake in Utah – and tastes really good! I happened to find this tiny 0.21 oz container which is handy. If it weren’t for this tiny container, I’d otherwise be carrying one variety or another of natural/sea salt. Again – replacing salt will be important. Season anything! Dehydration headache? Add to your water with some maple syrup and enjoy. A carb is my base food for dinners in particular. 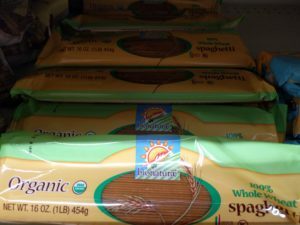 Any brand that is organic and whole wheat will be tasty and healthy. A good italian-dinner or even asian-inspired dinner substrate. Amore tomato paste is certified non-GMO (but is produced in Europe, hence no USDA organic certification). The flavor is AMAZING. Really. I was actually stunned to discover that the ingredient list includes: tomatoes. And that’s it. 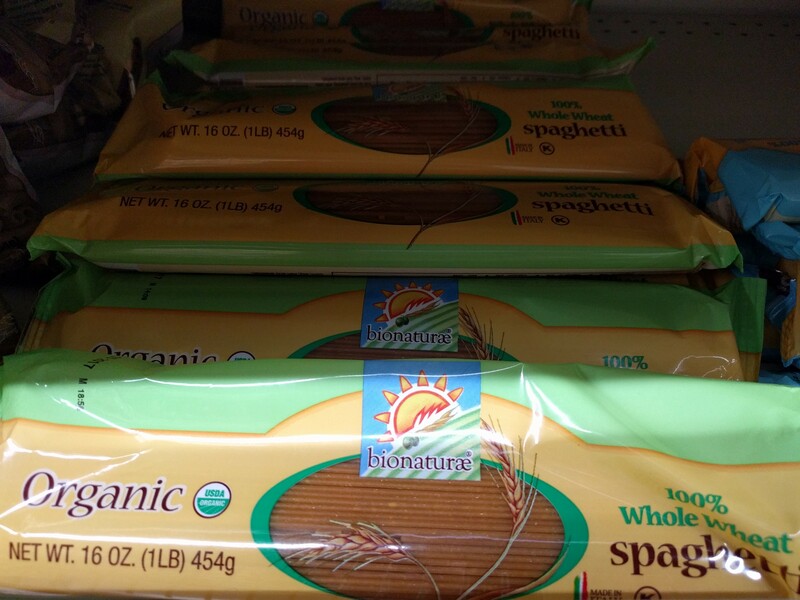 It will go great on pasta, probably with veggies like onions, garlic, broccoli, or spinach. Maybe dehydrated mushrooms, and possibly even a packet of salmon. Amore! 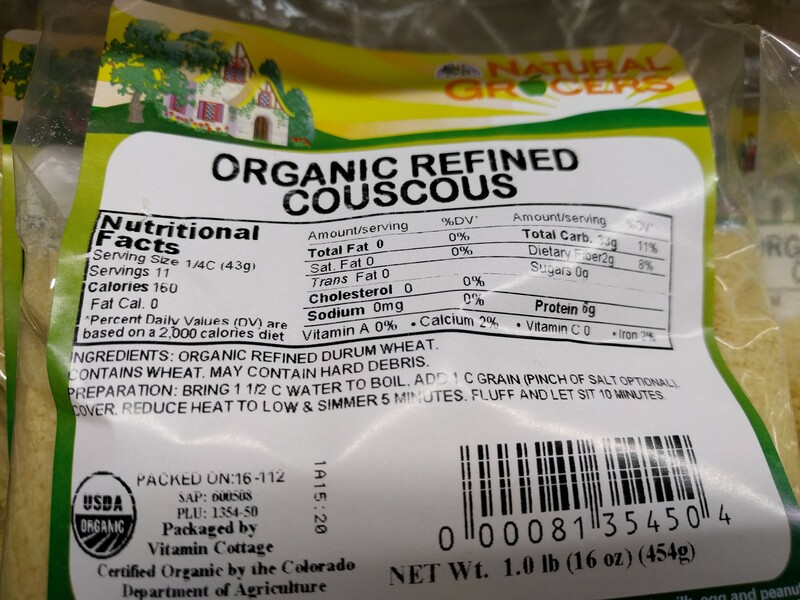 Quick cooking organic grains like couscous are great for dinner! Or breakfast! A currified version with raisins makes for a tasty meal. 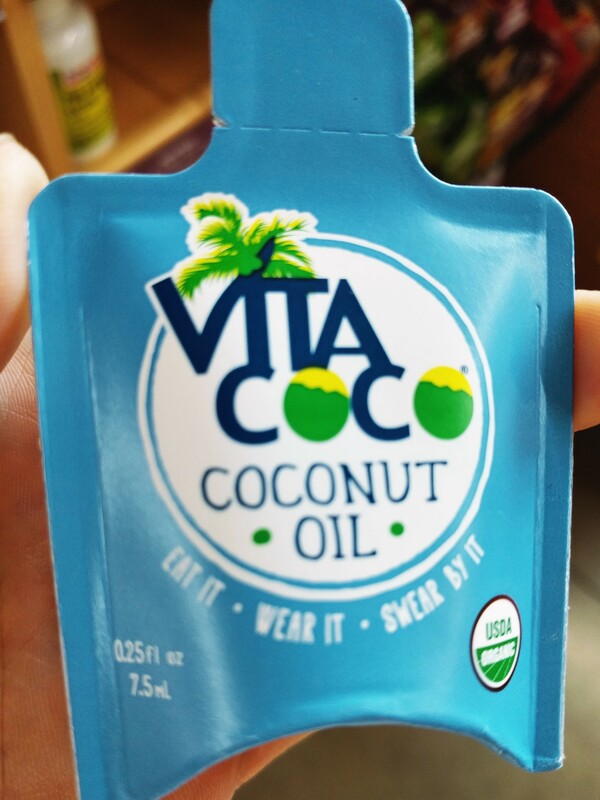 These little pouches are convenient and organic! Great for sauteeing the rare fresh veggie, for adding calories, or adding to hot chocolate for pure deliciousness. You can find organic dried mushrooms at most natural food stores. I’m a fungus fanatic, so find it hard to imagine leaving home without a pouch or two. 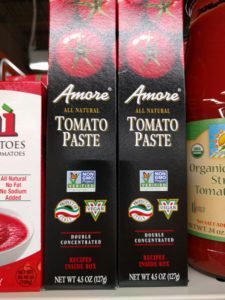 Add to pasta or beans or thanksgiving-concoction. Hell, add it to oatmeal with veggies for a savory oatmeal meal. Meal! 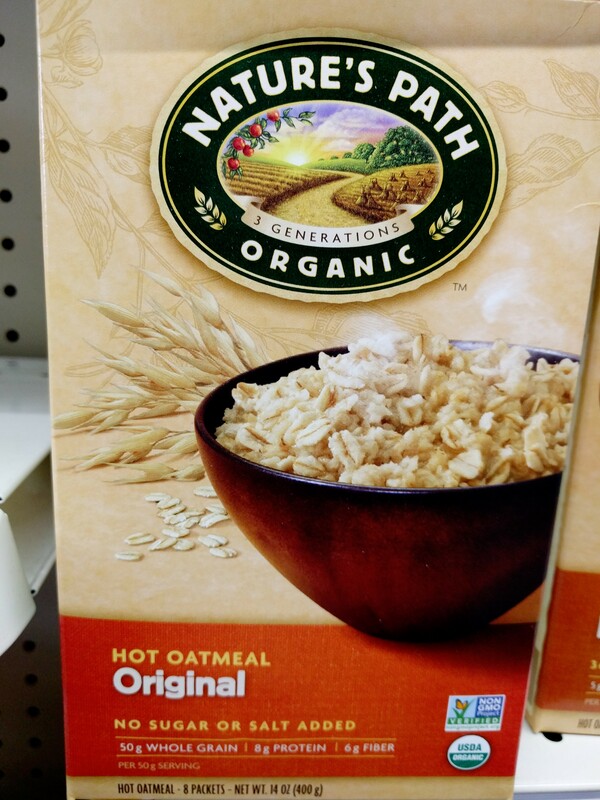 Nature’s Path Organic Original Oatmeal. Ingredients: oats. These packets are convenient and they hydrate quickly – giving them the advantage over your average bulk rolled (or even steel cut) oats. 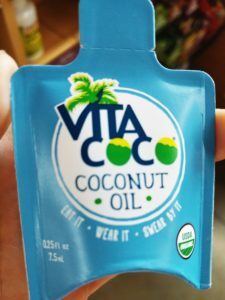 Makes for a great base breakfast food – I like to add maple syrup or honey, coconut oil or flakes, chia seeds, hemp seeds, dried fruit, and nuts for a sweet start. Or add mushrooms, veggies, and maybe even miso powder for a savory meal. Organic milk powder is no full-fat Nido, but it’s pretty damn good. High in protein and calcium. A great addition to breakfast oatmeal, “thanksgiving” dinner, hot chocolate, or on it’s own. And that about wraps up my shopping list! That was a lot of food and I’m not entirely sure I’ll be bringing all of it for my short trip, but I will definitely be bringing a good portion of it. Nice organic list. Obviously not possible to carry all or most of this. I have been studying the one single food type that stores forever and is guaranteed to work for long expeditions and this is pemican. I have been formulating this with coconut oil or rendered beef fat with low temp 120F dried beef ground to flour and combined 50_50 with the fat. The coconut definitely tastes better but melts in summer heat. The tallow product takes a little longer to acquire the taste. But for energy for me there is no better single product. Might check this out as it can reduce the cost and increase the calorie per gram over most alternatives. Thanks Steve – I’ll have to look into pemmican. I wont have time to make it for this trip but I’ll look into it for future trips. Any other recipe tips? GMO does not equal bad. Please explain why GMO is bad, it has saved thousands of lives.